Organic duck legs on the bone. 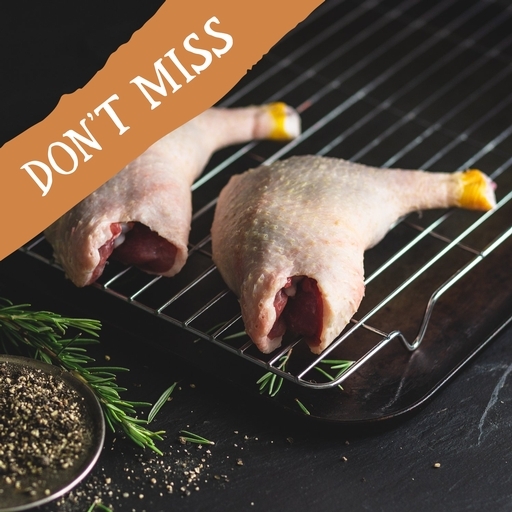 Succulent dark meat with rich, buttery skin, from ducks left to range free for the fullest flavour. Unlike the quick-cooking breast, duck legs do best with long, slow cooking. Braise in rich sauce, roast in a casserole or turn into a luxurious French-style confit. Approximately 2 duck legs per pack. Don't miss our duck legs. They will be available for deliveries between the 15th and 20th April while stocks last. Preheat your oven to 180°C/Gas 4. Season the legs well on both sides and lightly prick the skin all over. Sit on a wire rack above a roasting tray and roast for just over 1 hour, until the skin is crisp and golden. Rest for at least 5 mins before serving. Alternatively, you can confit the legs slowly, covered in oil or duck fat, for 3 hours in an oven set to 140°C/Gas 1.